Suggested Use: 1 capsule daily as a nutritional supplement. 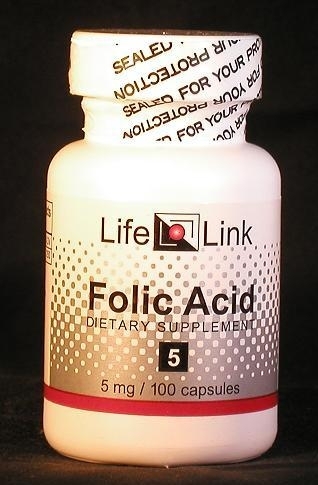 Folic Acid is a B-vitamin that is essential for DNA synthesis. It therefore plays a major role in the body, and its deficiency has been implicated in a wide variety of disorders. For example, Alzheimer’s disease, atherosclerosis, heart attack and stroke are correlated with low folate levels, as are osteoporosis, cervical and colon cancers, depression, dementia, hearing loss, insomnia, irritability, forgetfulness, psychosis, nerve damage, and various birth defects. Folate deficiencies are common, even in the First World; and less-than-optimal folate intake is probably the rule rather than the exception throughout the world. Furthermore, many drugs such as methotrexate, levopoda, niacin, phenytoin (Dilantin), carbamazepine, and theophylline can markedly reduce folic acid levels. Folic acid supplementation can decrease the body’s production of homocysteine — an amino acid associated with various ailments such as atherosclerosis, osteoporosis, bone fractures, hypertension, blood clots, strokes, Parkinson’s, Alzheimer’s, and other neurological and cognitive problems. Note: Extra folic acid can mask the symptoms of vitamin B-12 deficiency.